“In the Balkans the transition is over,” Remzi Lani, an Albanian political analyst, told me some time ago. But unlike in many post-communist countries, Lani didn’t mean a transformation from dictatorship to democracy. “We transitioned from repressive to depressive regimes.” He is right. The old communists and radical ethnic nationalists are largely gone; in their places is stagnation — economic, social and political. Russia wants to make clear that this is not what the people in the region want. Watching Putin’s visit to Belgrade and listening to his rhetoric, one couldn’t help but conclude that the confrontation in the Balkans between the West and Russia is changing both in nature and intensity. In the last decade, Russia was actively defending its economic and cultural presence in the region, but it never openly challenged NATO or European Union hegemony. Not anymore. At first glance, Russia’s ambitions seem unrealistic. The Balkans remain firmly entrenched in the West: Greece, Bulgaria, Romania, Croatia, Albania and Montenegro are all NATO members and Macedonia is on its way. Every country in the region is either a member of the European Union or aspires to join it. The European Union is far and away the region’s top trading partner, its biggest investor and the preferred destination for emigration. The conventional wisdom is that Russia might be a troublemaker but could hardly be more. The conventional wisdom could be wrong. 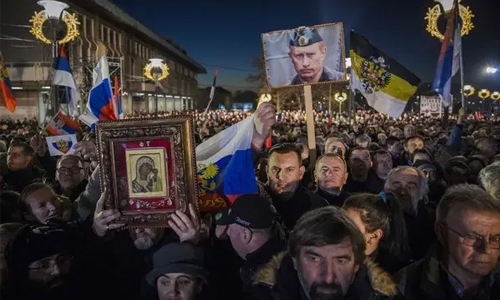 Moscow has sensed a critical vulnerability in the West’s position in the Balkans: While in places like Ukraine the European Union has been perceived as a symbol of change, in the Balkans it’s seen as the defender of a status quo that may be ready for disruption. Publics are frustrated and angry. Ethnic tensions are on the rise. Almost every country in the region has seen large-scale anti-government demonstrations. Economic growth is sluggish in most places, misery is widespread and the depopulation of the region is dramatic: More than 40 per cent of people born in Bosnia and Herzegovina have left the country; about 40pc of those born in Albania and about 25pc of those born in Macedonia have done the same. And while polls show that a majority of people still sees joining the European Union as the best road to prosperity, the promise of European integration is losing its talismanic power. Not only does the European Union’s future look uncertain, but leaders like President Emmanuel Macron of France have made it clear that they will not spend political capital advocating for the integration of the Western Balkans. And yet, even as sentiment in the region has changed, the European Union is reluctant to change its approach to it. This is in part the result of bureaucratic inertia and a lack of political interest. But it also comes from a fear that any policy change in the Balkans will seem like a betrayal of principles. The wars in the 1990s in the former Yugoslavia played a critical role in shaping the European Union’s post-Cold War political identity. Europeans saw the nearby tragedy not as a clash between states or nations but between two principles: the principle of ethnic nationalism, represented by Slobodan Milosevic, and the principle of multiethnic democracy, embodied by the European Union. Consequently, European Union policy toward the Balkans is more driven by ideology than in any other part of the world. Europe’s ideological rigidity is admirable, but it is also partly responsible for the region’s paralysis. This is best illustrated by the European Union’s role in the ongoing diplomacy between Serbia and Kosovo. The dialogue was initiated and encouraged by the European Union because everybody realises that mutual recognition between Belgrade and Pristina is the only way to remove the obstacles for deeper economic cooperation and pave the way for Serbia and Kosovo to join the European Union. But when President Alexander Vucic of Serbia and his counterpart in Kosovo, Hashim Thaci, began addressing the sensitive question of “correcting” their borders in order to reach a final agreement, major European capitals quickly declared that they would never allow it. Changing borders is never a great idea, especially after the traumatic experience of ethnic wars in the Balkans. But telling elected leaders that they cannot shape relations between their countries isn’t a great idea, either. So while European fears are legitimate about how changing the Kosovo-Serbia border could encourage other countries to follow suit, and the European Union is right to insist that any border changes should be supported by the majority of people in those countries, the message comes across poorly. It sounds like Europe is telling its naughty neighbour to stay away from sharp objects. And that’s why it has backfired. The chances for a Serbia-Kosovo deal today are much worse than they were months ago, and the risk of ethnic clashes is higher. That’s where Russia comes in. Last November, Putin met Thaci, despite the fact that Moscow doesn’t recognise Kosovo as a state. The meeting signalled that Russia does not see its role in the Balkans only as Serbia’s protector, but also as a potential power broker. That’s why Europeans should not be surprised if Russia soon produces its own road map for normalising Serbian-Albanian relations. (They also shouldn’t be surprised if Turkey expresses interest in such a Russian initiative.) In other words, Russia’s actions in the Balkans are not only spoiling games. Moscow wants to replace the European Union as the mediator for solving regional conflicts, in the way it is attempting — largely successfully — to replace the United States as a mediator in the Middle East. On Jan 25, after 27 wasted years of disputes, the Greek Parliament finally approved Macedonia’s new name, North Macedonia, putting an end to one of the conflicts that has been haunting the Balkans. This was a real victory for the European strategy for the region. Now, Europe should find similar energy and flexibility to push Serbia and Kosovo to find their own compromise. That’s the only way it can stay relevant in the region — not by being a force for the status quo.